LONDON (Reuters) - Gold prices fell back to a near five-month low on Tuesday ahead of a widely expected U.S. interest rate increase this week and as investors eyed clues for further hikes going forward. Spot gold fell 0.2 percent to $1,239.93 an ounce by 1441 GMT, after hitting its lowest since July 20 at $1,239.21. U.S. gold futures fell 0.4 percent to $1,242.60 an ounce. With an interest rate rise expected, the market is watching the U.S. central bank's two-day meeting for clues of the Federal Reserve's future rate path. "The rise is already in the price so it's more about the outlook the Fed gives," said ABN Amro commodity strategist Georgette Boele. Gold is sensitive to rising U.S. interest rates as these increase the opportunity cost of holding non-yielding bullion and boost the dollar, in which it is priced. 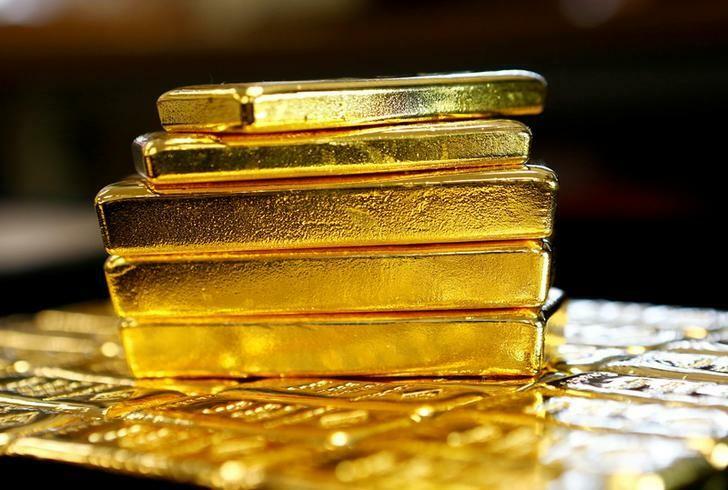 Analysts at Standard Chartered noted that gold would likely recover quickly from its recent lows if the meeting outcome proves to be a small rise. In wider markets, world stocks paused following gains for three straight sessions, while the dollar strengthened. Oil rose above $65 a barrel for the first time since mid-2015 as an unplanned shutdown of the UK's biggest North Sea oil pipeline supported a market already tightened by OPEC-led production cuts. "(The) opportunity cost of holding gold is going up because if you hold gold then you miss the opportunity of higher equity prices or maybe higher bitcoin prices," said Societe Generale's head of metals research Robin Bhar. "Gold doesn't have a lot of love going forward at the moment." Bhar pointed out that this was to be Fed Chair Janet Yellen's last meeting and that she was therefore likely to keep any forward-looking statements consistent with previous ones. Among other precious metals, silver rose 0.4 percent to $15.77 an ounce. Platinum fell for its eight straight session, down 1 percent at $876 ounce, after earlier touching its lowest since February 2016 at $871.10. Platinum is more heavily used in diesel vehicles, which have fallen out of favour since Volkswagen's emissions-rigging scandal. Its sister metal, palladium, has benefited from the switch to petrol engines and expectations for growth in hybrid gasoline-electric vehicles. Palladium was 0.3 percent lower at $1,007.12 an ounce. The platinum discount to palladium widened to around $120 last week, the steepest since April 2001.